Last night, I watched Game 7 of the NBA Finals with bated breath. I was, quite literally, on the edge of my seat, hoping against hope that the Cleveland Cavaliers would pull out a win. And, much to pretty much everyone's surprise -- unless you were from Cleveland, that is -- they did. It's not easy being from Cleveland. We're the brunt of everyone's jokes. We hadn't won a sports championship in over 50 years. We're referred to as "The Mistake on the Lake," for crying out loud. Saying you're from Cleveland comes with derision, with pity, with people acting like your hometown is worthless. Yet I have always been proud to say I'm from Cleveland -- especially during my time in Pittsburgh, a city that hates Cleveland to its very core. And living in Pittsburgh as a Clevelander was HARD. Every time people asked me where I was from, I'd watch their eyes color in disgust once I said, "Cleveland." I actually had to say, "Don't worry, I don't like the Browns" so many times, it started rolling off the tongue way too easily. And I shouldn't have felt the need to do that -- because my hometown raised me and helped shape me into the person I am today. Most of my family still lives there. Many of my friends moved away but are slowly making their way back. And, no matter where I've lived, I always refer to Cleveland as HOME. I can't even say that I've always been a Cleveland sports fan, or a Cavs fan in particular. Because, let's face it, when your teams always lose, it's hard to keep rooting for them. But in the past few years, something changed. This Cavs team brought me a renewed sense of pride and dedication to the city I know and love. I tuned into the postseason last year, hoping against hope that we would win but knowing it would be darn near impossible with two of our big players injured. I conceded the fact that Golden State played better, played harder, played stronger. But this year, when we had the chance at a rematch -- and all of our players were healthy to boot? How could I NOT watch? So I tuned into the whole postseason once again, hoping and praying that LeBron, Kyrie Irving, Kevin Love and all the rest would bring us a championship. I watched all but one game (which we lost), and all but two all by myself from the sanctity of my apartment (we lost those two as well). My hopes soared, they were dashed, the team made my heart feel like it would simultaneously explode and leap out of my chest. I watched this team bring pride and glory to the city of Cleveland and the state of Ohio. And, last night, I watched them bring us a championship. A coast to coast celebration! FaceTiming with my brother, Evan, who lives in Boston, right after Cleveland clinched the championship. We were both screaming! 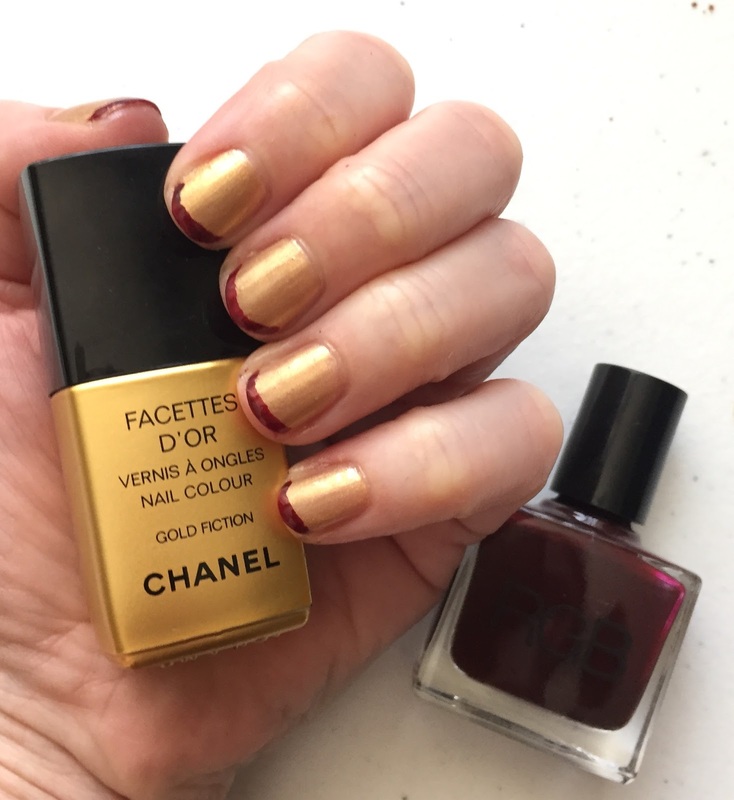 A wine and gold French manicure, using Chanel Gold Fiction and RGB Oxblood, to show off my Cleveland pride! So, today, I wear my Cleveland pride as loudly as I can -- with a manicure, of course! This is a momentous occasion and I felt it only fitting to let my nails do the talking. I reached for the wine and gold this morning in the best way I knew how to display my happiness -- with a French manicure featuring the colors of the Cleveland Cavaliers. 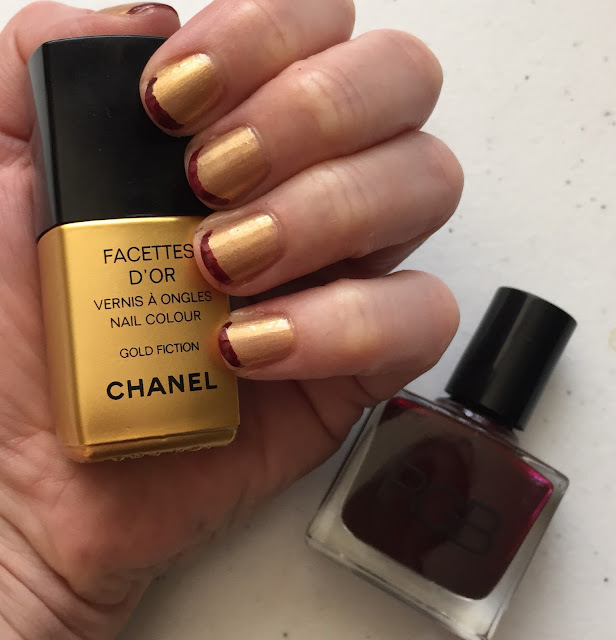 I chose Chanel Gold Fiction (my all-time favorite liquid yellow gold) as the base, and RGB Oxblood (a dark, creamy maroon) for the tips. I freehanded the tips, and they're not perfect -- much like Cleveland's storied history -- but they're good enough for me, and this manicure helps me display said Cleveland pride to the world! Wine and gold runs through my veins. And there's really only one way to sign off -- CLEVELAND ROCKS! Love this mani! That gold is gorgeous. I absolutely love this mani, Jamie! It was an amazing win, and well deserved! So now you're a sports writer with heart and panache?! As a Detroit native I know the hate. With enough faith though these teams can come through for us. Your mani definitely honors the team. I love that you polished your nails in Cleveland Cavaliers colors!! How fun!! Haha - Cavs fans! Love it :) And so sweet to have that time with your brother even if only through Facetime.